Toronto got off to a relatively slow start, only scoring 20 points in the 1st quarter. The Raptors were led by Kyle Lowry and Serge Ibaka's combined total of 10 points. Washington was led by an unlikely hero - their backup PF Mike Scott. Scott dropped 8 points in the period, a lot of those points coming off of John Wall assists. The Raptors trailed 20-30. The Raptors flipped the switch in the 2nd quarter, the difference being that Toronto started playing good offense. Lowry was going off and scored 10 points in the period. At the 8:14 mark in the quarter, Fred VanVleet threw a beautiful alley-oop pass to Pascal Siakam. Pascal caught the ball and slammed it down across his body for the powerful dunk. Washington's Bradley Beal and Markieff Morris combined for 13 points, which was more than half of the Wizards' points scored. Toronto was behind 50-53 going into the break. Washington's backcourt exploded on to the scene coming out of halftime. Bradley Beal scored 12 points, while John Wall put up 8 points. 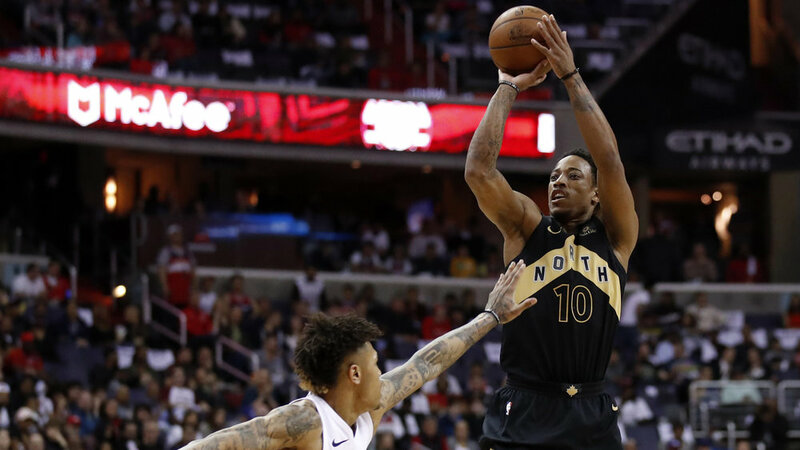 They were combatted by DeMar DeRozan's 12 points, but the Wizards still outscored the Raptors on offense. At the end of the 3rd quarter, Toronto trailed 73-78.